weight you resist on the gym’s infernal machines. becomes moot, as you do too, moot and mute. you’re here for the latter, that trivial matter. 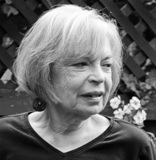 Sandra Kohler describes herself as “a septuagenarian, wife, mother, mother-in-law, grandmother, lover of Shakespeare and Elena Ferrante, of mysteries and crossword puzzles, of Philadelphia Flyer's hockey and the music of Mahler, Sibelius and Dvorak, gardener, sometime teacher and, above all, I hope, a poet.” The author of three collections, one of which won the 2002 Associated Writing Programs Award Series in Poetry, Sandra lives in Dorchester, Massachusetts. I will post this poem in our waiting room to encourage substantive discussions of life and death; improving quality of the former and delaying the latter. "thereâ€™s more to resist than weights" --especially when dealing with the medical profession! Excellent poem! Love the humor in this poem! Truth about life, artfully and amusingly presented. This poem 'grabbed me' at the opening question.Pure delightful reflections. Thanks Sandra! So difficult to be present in the present, isn't it? Embrace that jab of the needle, embrace the resistance training. We have no choice but to embrace the end when it embraces us. Good musings presented in a poetic way. Wonderful Sandra! Having just been ticked off for not having a flu-jab feeling it was a mite unnecessary at 92 - . I've had a good laugh! This is brilliant, Sandra. I am following a course in 'medicines adherence', but while doctors know so much about medicine and so little about physical health, I am tempted to concentrate on the latter.